Thanks to Erin Ptah, I recently found out about the ostrich egg globe that was discovered by an Austrian collector. Dated to around 1504, it appears that the halves of the egg were cast separately, then glued together. It’s quite similar to the Hunt-Lenox Globe from around 1510, to the point where it might well be a prototype for that globe. Among other things, both include the phrase Hic Sunt Dracones, or “Here Be Dragons.” While this has become a famous phrase rumored to have appeared on a lot of old maps, these two globes are the only ones known to use those exact words. Others warn of monsters, but not with that specific wording. It’s on the globe around the southeast coast of Asia, and it’s been suggested that it could refer to either Komodo dragons or the cannibalistic Dagroins mentioned by Marco Polo. The latter possibility is referenced here, but the same page states that Polo had actually said the Dagroins lived in Sumatra. Anyway, a notable aspect of these globes is that they included America. Well, part of it, anyway. South America was there, and in basically the right shape; but only a few islands were shown north of that. 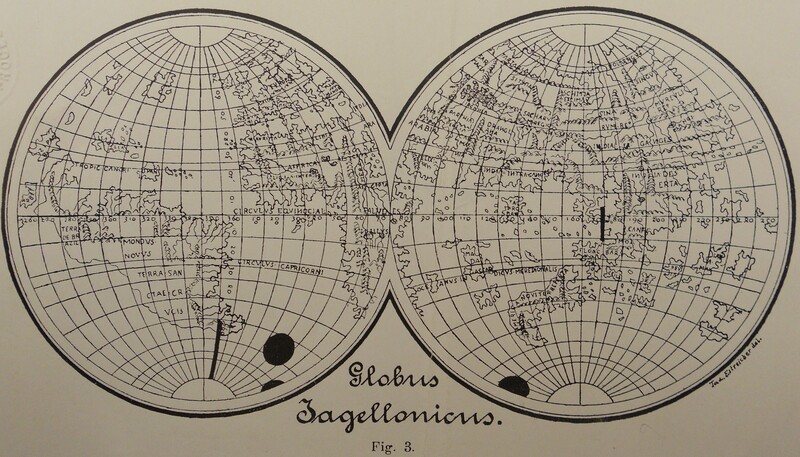 The Globus Jagellonicus, also from around 1510, shows the same thing. Aside from that, one thing that struck me on looking at projections of these old globes was the strange landmass located to the south of India. While it could possibly be a misplaced Australia, the Jagellonicus actually refers to it as…America. So how does that work? It appears to have something to do with how Christopher Columbus maintained that he had reached Asia, and not a previously unknown continent. This brings us to an even earlier globe, believed to be the oldest extant (although we know that terrestrial globes existed as far back as the second century BC), Martin Behain’s Erdapfel or “Earth Apple.” This showed a much smaller world, consisting only of Europe, Asia, and Africa. There are rumors that Behain was in communication with Columbus; and even if he wasn’t they both belonged to the same school of thought, which held that sailing west from Europe to reach China was entirely feasible. The size of the Earth had been determined fairly accurately in the third century BC, so contrary to the myth that the people in Columbus’ time thought he’d sail off the edge of the world, most scholars realized that Columbus’ idea would actually mean a longer voyage. The first European explorer to determine that he had actually come upon a new continent might have been Amerigo Vespucci, which is likely why Martin Waldseemüller called the place America on his famous map from 1507. He left it off later maps, perhaps thinking twice about naming the New World after Vespucci, but the name stuck. The Wikipedia page for the Americas suggests that its popularity might have had to do with how well the name fit with Africa and Asia, and of course Australia and Antarctica later followed the same pattern. The mapmakers seemed to be hedging their bets by essentially showing two Americas, and not in the sense that John Edwards meant it. Mind you, if the continent was named for Vespucci because he discovered it was an entirely new landmass, it doesn’t make a lot of sense for the makers of the Jagellonicus to apply that name to the surmised island near Asia. Oh, well. 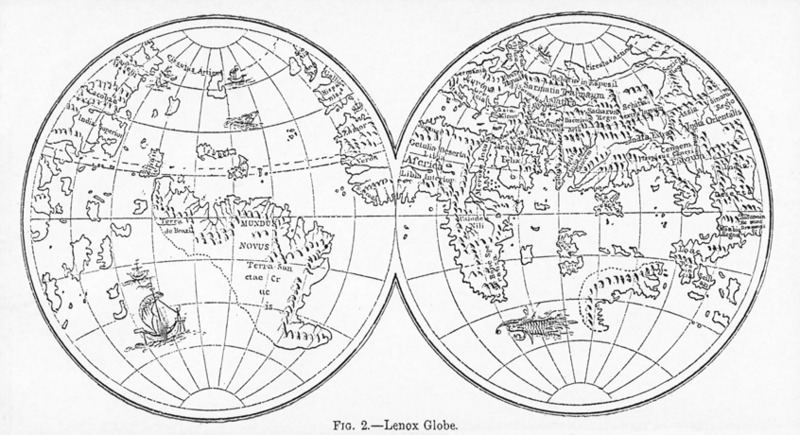 Also interesting to note is that Johannes Schöner depicted America as a separate landmass on his earlier globes, but his later ones connected it to Asia. This entry was posted in Age of Exploration, History, Maps and tagged america, amerigo vespucci, antarctica, asia, australia, christopher columbus, dagroins, dragons, erdapfel, ferdinand magellan, globes, globus jagellonicus, hic sunt dracones, hunt-lenox globe, johnannes schoener, marco polo, martin behain, martin waldseemueller, terra australis, tierra del fuego. Bookmark the permalink.